Fantastic bead projects for the classroom, Sunday School, VBS, camp, fundraisers and other activities. Beads & supplies are available at our online store, www.BeadBee.com. 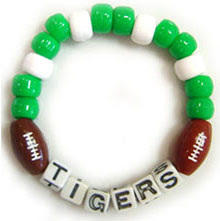 Parents, teachers and kids love creating key chains, bracelets and necklaces to show school spirit and team pride. With plastic alphabet beads, you can spell your team name and add colored plastic pony beads in team colors. We have 30 different colors in pony beads including colorful mixes. Pony beads are a great option because of the large selection of colors. They are also very budget friendly, especially for large group activities or fundraisers. We also have plastic sports ball beads which are perfectly sized to work with our plastic pony beads and 7mm alphabet bead cubes.